If you’re like me and you’ve recently had a new/replacement bank card, you will have probably noticed a slight change in the appearance of your new card. The new wireless-looking symbol represents contactless payment capabilities based on radio frequency technology. This means that, in theory, you can make low transaction payments (up to £20 as of this article I believe) simply by tapping on an EPOS terminal without entering your PIN, probably saving you about half a minute every time you make such a payment. Now the not so smart move made by TFL is that it looks like they did not capture user requirements based on this new model of accepting payments. I would not be surprised if more than half the Oyster card holder population also had their bank cards in their wallets together. Not an unreasonable assumption right? See where this is going? If you have your Oyster card and contactless bank card in the same wallet, it is now possible for you to be inadvertently charged on your bank card even if you have a credited Oyster card. Note that there is a system in place to detect such an incident taking place and if successful, you should receive a message on the Oyster screen informing you that two cards have been attempted to be used. However, as we all well know, technology isn’t 100% so there is a small chance that the wrong card will be charged. See this disclaimer by TFL advising users to keep their cards separate. Obviously this doesn’t solve the problem of the reader only reading the bank card but there are technological advances that can be made around this area to improve card detection. What advice should you take from this new payment model? 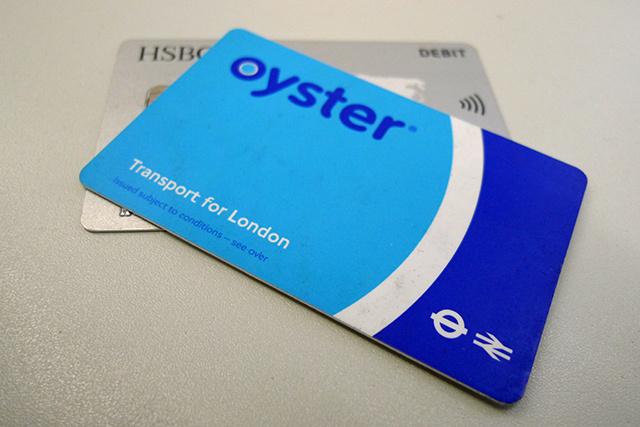 Simple; keep your Oyster card and any contactless bank cards separate otherwise you’ll risk being charged on the wrong card!